Tis the season for sweet treats – and what’s sweeter than baking a warm, spicey ginger bread cookie with a sinister twist? 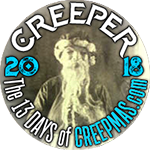 Today, to celebrate Creepmas with you, I’m sharing a delicious and easy ginger-dead cookie recipe. What’s so fun about them is you can decorate as creepy as you like! My piping skills are very amateur (which you can tell by the photos), but the sloppiness gives them some character!